Growing up on Toronto's desolate margins in the eighties, sixteen-year-old Mel Sprague has a lot on her mind: The A-bomb. Acid rain. Where her dad's been hiding out for the last fifteen years...Mel's younger sister, Lora, knows that despite her sister's 'talent for misery,' Mel's preoccupations aren't unusual. After all, Mel might stay out all night now and again, but in the Sprague family, teenagers are troubled by definition. When she vanishes, however, what were once the diversions of a teenage girl are taken up as evidence, leading investigators to ask if Mel Sprague chose to run away, this time for good. Lora, for her part, just knows that someone has taken her sister and, disquietingly, fears that it wasn't a stranger. Being a fifteen-year-old girl isn't easy -- and that's without experiencing an event that transforms everyone in your life into a suspect or a potential victim. Before her sister vanished, Lora's world was relatively simple, but Mel's disappearance creates a new and indelible division; everything changes, and there is nothing that is untouched by her loss. 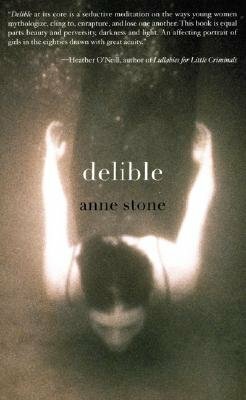 "Delible" is Lora's story. Through her unblinking eyes, we witness one family's experience of sustained uncertainty and come to see how our identities also exist in those traces we leave behind.